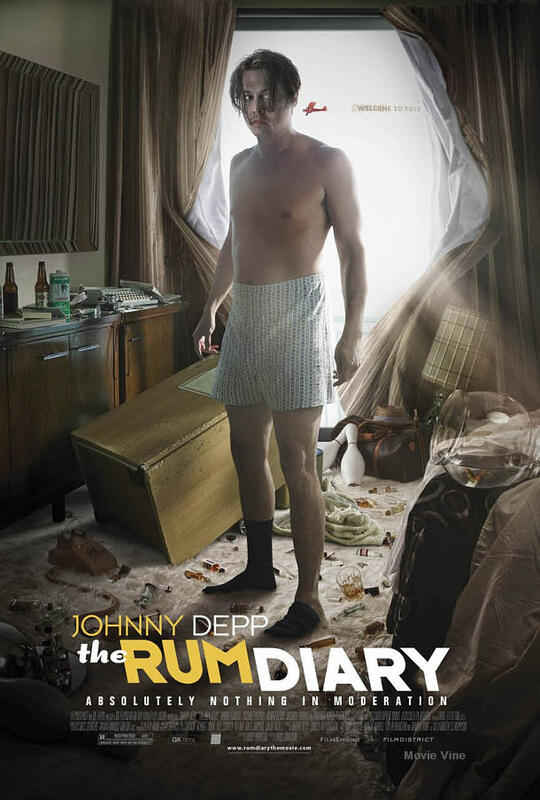 A film of which has held onto my anticipation since filming in 2009 and has combined the great Johnny Depp once again with the also terrific Hunter S. Thompson‘s writing is The Rum Diary, released on October 28th, 2011. The film lived up to and beyond my wildest expectations of a crazy journey into the mind of a journalist, Paul Kemp, as he discovers love, betrayal and rum. The Rum Diary, written for the screen and directed by Bruce Robinson is a captivating work of art that provides in itself, a moral value of heart. The film also stars Aaron Eckhart, Michael Rispoli, Amber Heard, Richard Jenkins, Giovanni Ribisi and Amaury Nolasco. The acting in this film is similar to 1998’s Fear and Loathing in Las Vegas. A blend of random hijinks and serious conversation keep this film in check with the bitter taste of the world and the humorous side of human error that comes with it. Johnny Depp is flawless as Paul Kemp and the other performances are top notch, also notably Giovanni Ribisi’s role as Moberg, a drunken Hitler admirer with odd beliefs. The music of the film is well performed to match with the tone and timing of the setting. Every piece is designed to help drive the story and the characters’ thinking. Not one track fails to leave the scene with an overlapping treat to the ears. The film is lengthy, but paces well. Each scene is well done and the film never drags on to great lengths. The crafting and editing of the film helps bring the story to life in a great blend of performance and flawlessness. The writing is the top notch performance that I had expected. Well written scenes and dialogue place the film among the tops of 2011 and with it, brings many laughs and provides great emotion into the hearts of the audience. This is truly a Hunter S. Thompson adapted piece. I walked away from the film wondering about the “bastards” of life and what I could take away from the film. The experience led me to the wanting of making a crafty project of similar proportions and has captivated me. There isn’t one bit of the film I didn’t enjoy and as a young man, I would recommend the film to anyone over the age of 18, as the film does have some crude humor and language, but all of which add to the story. Comments for “Are they not complimentary?” – A Review of “The Rum Diary” are now closed.